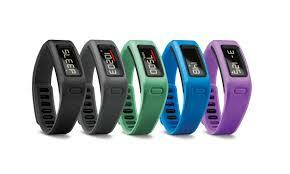 Garmin’s Vivofit – Get’s you Going, Keeps you Going! Check out Vivofit, the newest entry into the fitness band market, Vivofit actually learns your current activity level, *sigh* and then, assigns an attainable daily goal for you. As you manage to push on and meet those milestones, your Vívofit will set the bar just a little higher for the next day, gradually stepping you up to attain your fitness goals. Vivofit also maintains a free online community where you can view and track your progress. Sure, Vivofit tells the time, but it also has quite a few additional features to keep you motivated. Use the optional heart rate monitor with your Vívofit in order to record your heart rate and zone data, and to get more accurate calorie burn information. Garmin Connect, the free online community that the company offers, allows you to challenge other Vívofit users, and start your own competitions with friends and family, in order to compete for badges and some all important chest thumping. Your Vívofit will be your constant companion, and it keeps on “ticking” for more than a year without ever having to change the battery. Setting the sleep mode when you go to bed, then allows your band to track the quality of your sleep. Just log on to see how long you snoozed, and your periods of thrashing about. The Vívofit band is also water-resistant, so YES, you can shower, or jog in the rain, without having to worry. Get yours for around 140 bucks at amazon.com, and me? I’m going to start getting off the couch, you know, right after the last of the cake is gone.